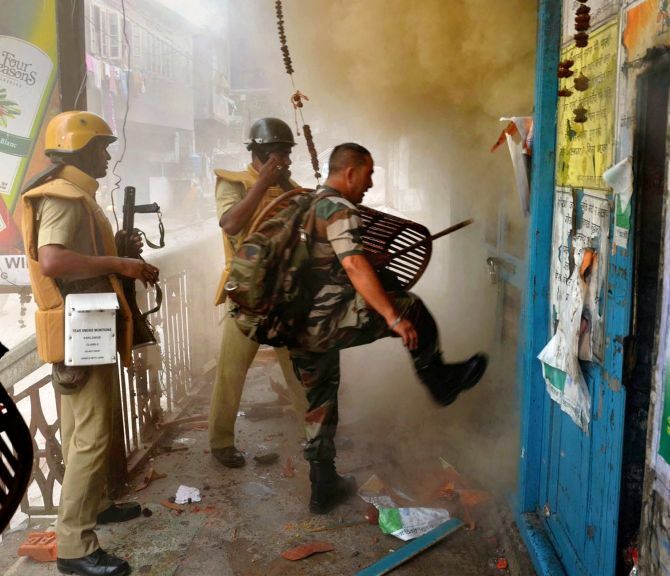 The situation in West Bengal’s communal strife-torn Baduria in North 24 Parganas district remained tense today even as the spat over the clashes continued between Governor K N Tripathi and Chief Minister Mamata Banerjee. With the clashes threatening to disrupt inter-faith harmony, Banerjee said her government has decided to form peace-keeping forces across the state involving local people and assisted by state administration and the police. A police officer said no untoward incident was reported till Wednesday afternoon from Baduria though the situation is tense, adding forces have already been deployed across the entire area and they have cleared roads blocks put up by local residents and conducted route marches. Announcements are being made via public address system asking people to maintain law and order, he said. Schools, shops, markets and business establishments remained shut in and around Baduria, including Keosha market, Banshtala, Ramchandrapur and Tentulia, where prohibitory orders are in force. Four companies of Border Security Force personnel (about 400 personnel) have been rushed to Baduria and adjoining areas of Basirhat, Swarupnagar and Deganga to assist the local administration. Rail blockades at three places on the Barasat-Bongaon and Barasat-Basirhat sections in the morning inconvenienced daily commuters. Violence had erupted between two communities at Baduria in Basirhat sub-division of the district since Monday night over a Facebook post, following which a young man was arrested. Banerjee said the peace-keeping forces, called ‘Shanti Bahini’, will be stationed in 60,000-odd booths across the state to maintain communal harmony. The clashes had triggered an unprecedented spat her and Governor Tripathi, whom she accused of acting like “a Bharatiya Janata Party block president” and “threatening” her. The governor dismissed her charges as baseless saying these were meant only to emotionally blackmail the people of the state. “Instead of making accusations against him, it is better for the chief minister and her colleagues to direct their attention to maintain peace and law and order in the state without making any distinction on the basis of caste, creed or community,” a Raj Bhawan release quoting the governor said. “It is wrong to say that Raj Bhawan has become the office of the BJP or the RSS,” it said. Amid the continuing spat between Mamata and her party colleagues and the governor, the BJP demanded that the Centre impose President’s rule in West Bengal and send central observers to assess worsening law and order in the state. “We demand that the Centre intervene and impose President’s rule in the state. The Centre should send a team of observers to assess the worsening law and order situation in the state,” BJP state president Dilip Ghosh told reporters. The Communist Party of India-Marxist has also accused the TMC government of failing to protect the people at Baduria and has demanded an all-party meeting to deal with the situation.